The ProForm Performance 400i is ON SALE! Price Alert: $300 OFF the Regular Price! One of the reasons ProForm is so successful is they offer more for less and the ProForm SMART Performance 400i is a perfect example. The Performance 400i is iFit Coach Ready. ProForm is part of Icon Fitness, which also builds NordicTrack, Gold’s Gym, Weslo, Epic, and Image. ProForm is able to offer some of the best value in the $600-$1,000 price range. The ProForm Performance 400i treadmill is a great example of high quality for a lower price. It has some limitations, but does a great job of surpassing many comparably priced machines. Although people often buy this as a running treadmill, we would recommend it for primarily walking and light jogging for one or two smaller users who work out several times a week. Taller users are going to want a machine with a bigger motor and larger running/walking surface. 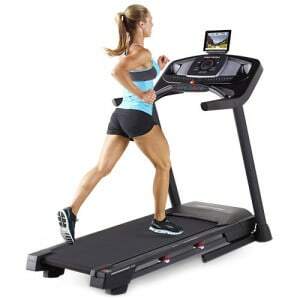 Remember that $699 is a low price for a treadmill and it even comes with free shipping! MID-WEEK SALE ENDS THURSDAY: The SMART Performance 400i is currently priced at $699. This is $300 OFF the Regular Price! iFit Coach Ready – This feature allows you to download a Google Maps route or create your own so that you can run in exciting locations around the globe. The treadmill will automatically adjust the incline to mimic trail routes from Mongolia to Barcelona. The library of workouts is ever-growing and created by certified personal trainers. You can manage you iFit account online to track your progress towards your fitness goals. The SMART Performance 400i comes with 1-year FREE iFit membership so you can test out the features before paying a subscription fee. 7″ SMART HD Touchscreen — For such a low-priced machine, this is a pretty cool feature. It lets you easily view and swipe through your workout stats and iFit programming. 2.0 Continuous Duty Motor — This motor is adequate for walkers and light joggers. If you want to do some intense running, you may want to look for a more beefy motor. 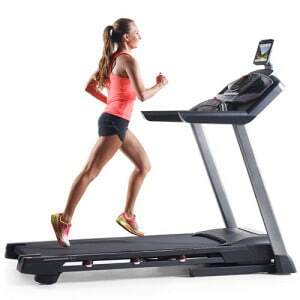 Easy Fold — Folding is always a great feature on a treadmill especially when it has a easy-lift shock to assist with the transition. 300 lb. Weight Capacity — Remember that this is a budget level treadmill so we’d recommend below 275 lbs. 18″ x 50″ Treadmill — It’s a pretty small deck size in all honestly. It still beats out cheap-o models you find at Walmart. Some “cheap” brands will go as narrow as 17″ with a 48″ width. So, 18×50″ may work fine for you (especially if you’re a smaller person.) Tall users should probably look at a machine that is 60″ in length. Shock Absorption — There are better machines out there with more sophisticated shock absorption. Still, if you’re comparing this to walking on the street, the ProShox deck is a vast improvement. 50 Workout Apps — One word…wow! That’s a lot of programs. You get 50 built-in workouts that are designed by a certified personal trainer. Preset speeds, inclines, and time will help you reach your maximum performance. We find that these preset workouts help prevent boredom. Speakers with MP3 Input — Enjoy your music while you workout. These speakers have decent quality. You can also plug in your iPod directly into the machine. Warranty — You get 25 years on the motor and 1-year parts and labor. Reasonable at this price. ProForm Performance 600i – Read the full review here. The improvements on the console make this a very nice budget treadmill option. iFit is a truly excellent interactive feature on the Icon machines. The Proform SMART Performance 400i allows you to take advantage of a trusted name in fitness while spending much less money than you’d expect. 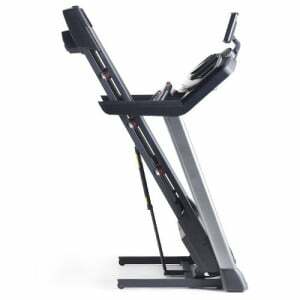 This is a great value at $699 if you’re only planning on moderate exercise. ProForm has the best budget machines in this price range because their machines offer a lot of features for a low price. You may also want to check out the Performance 600i for a larger motor, longer running surface, a larger 10″ SMART HD Touchscreen, more incline/speed settings, and a better warranty. Overall, worth it! 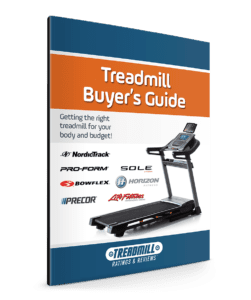 Check out a comparison chart of all ProForm treadmills here. Go to www.proform.com/treadmills to learn more! I wish I found this review before I bought this treadmill. Everything about the treadmill PF 400o is what I wanted and thought I needed, except the motor size. I want to run. At best, over time maybe a continuous 8 min/mile. I am just afraid this won’t work. Thanks for the review.